Scottish and Welsh leaders say PM is leading the country towards a catastrophe. Brexit: UK 'not prepared' for a no-deal scenario (file pic). 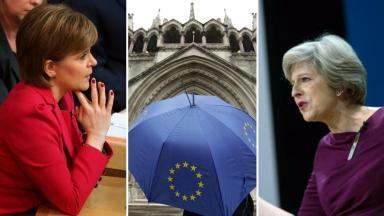 Theresa May must ask for an extension to Article 50 before the UK crashes out of the EU without a deal, the Scottish and Welsh first ministers have said. In a joint statement, Nicola Sturgeon and Mark Drakeford called on the Prime Minister to ask Brussels for a new deadline and put forward legislation to scrap March 29 as the day the UK leaves the EU. They also called for her to take the no-deal option off the table and drop her red lines in the ongoing Brexit negotiations. The statement said: "We are particularly keen to do so to press home the point that all the evidence we have seen to date suggests that the UK is simply not prepared for a no-deal Brexit in less than two months' time. "Our firm view is that such an outcome to the Brexit negotiations would be a catastrophe which would cause significant short-term disruption to the lives of ordinary citizens as well as to businesses and long-term harm to our economy. "And while a longer period to prepare for no deal as proposed by some Conservative MPs might reduce the risk of people in Scotland and Wales being unable to access the medicines that they need or the range of foods they want to buy, it would do nothing to mitigate the longer-term economic damage that such a radical rupture with our EU neighbours would cause." The statement notes that a no-deal Brexit has been estimated to cost the Scottish economy £14bn a year by 2034, while Theresa May's draft deal was soundly rejected by the Commons. It continued: "The point has been reached where there is now no time to waste. We therefore renew our call for the Prime Minister to make clear that she and her Government will ensure 'no deal' is taken off the table. "This should include putting forward secondary legislation now to remove 29 March 2019 as Exit Day from the EU (Withdrawal) Act. "The Prime Minister must also request an extension from the EU of the Article 50 deadline. "We call on the Prime Minister to request such an extension immediately to put an end to the threat of the UK crashing out of the EU without a deal in only eight weeks' time." The statement concluded: "The EU has made it clear that in terms of negotiations on the future relationship, it would respond favourably if the Prime Minister was to drop her 'red lines'. "We therefore further call on the UK Government to abandon those red lines, which the EU has repeatedly said severely restrict the possible outcomes of Brexit." Ms Laird said: "With 50 days left until we leave the European Union, the only thing that is clear is that a no-deal Brexit would be catastrophic for jobs, industries and Scotland's economy. "It is shameful that the UK Government still maintains that this an option, and it should rule it out immediately." Mr Mundell said: "I urge the Scottish Government to work constructively with us ahead of our departure from the EU. By working together, we can avoid a no deal Brexit which would be hugely damaging for people and businesses in Scotland." He was speaking ahead of meeting of devolved administrations and UK Government at the Joint Ministerial Council, which he said is part of "extensive ongoing engagement".